Finding myself in challenging discussions while coaching “change adverse” individuals from time to time, I try to make myself humble and ask “What would sensei do in this situation?” I cycle through the words and actions of Mr. Nakao, Mr. Nagata or Mr. Shimbo of the Shingijutsu Company. Usually I can select an appropriate approach. “Show me” is a good way to move the discussion out of the meeting room and to the factory, the evidence, and the facts. The “genchi gembutsu” (go see the facts) approach almost always clears up misunderstandings, exposes the truth (or truths), and focuses the discussion on what matters. The “Why?” phrase is an opener to the 5 why root cause analysis process. There are three typical outcomes of the 5 why process. The first is the very simple and practical actions to address the known root cause of the problem. The kaizen activity can be tested and the results of the test will be visible. The second is the unknown or invisible root cause. There may be multiple interacting factors, or it may not be visible, such as a transactional process. This is where you can use a Design of Experiments or call in your Six Sigma Black Belts. The third type of root cause is systemic, structural, or strategic and points kaizen activity away from the Gemba to the office processes and executive suite. These are useful for elevating the issue and expanding Lean implementation beyond the factory. 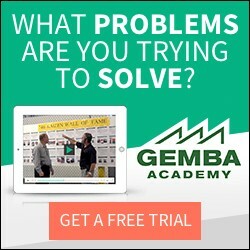 If the managers in question are reluctant to go to the Gemba, can not or will not show you the facts, this says an awful lot about their position in the debate. It is probably not based on fact. The “Why?” question can come in handy again here. Even after you have used the “show me” phrase and then the “why?” questions have identified the actionable root cause, people don’t always act. At this point only evidence can trump mistaken convictions. So you can say “just try it”. It’s only a test. If it doesn’t work, we can switch it back, or try something else. Sure it takes a degree of authority to get away with using such a limited vocabulary in trying to convince smart and experienced people. Without a certain degree of respect and credibility it’s very difficult to lead change in any environment. I’ve found that when leading change it’s actually easier to use fewer, simpler phrases than to throw around a lot of fancy jargon. Start with humility, the willingness to admit when you are wrong, and the confidence that the kaizen process will help you meet your goals. Then listen until you find the right time to use the three phrases. I´m from Brazil and I´m just starting a Lean Journey throught a Corrugated Sheet and Carton Sector Inddustry. Thanks for all you information! I’m from Egypt and I’m just starting a Lean Journey through M/V Cables Industry. hey there. Is there any body who knows KAIZEN implemented in technical schools? My company and I have attended several KAIZEN events. We are eager to learn as much as possible to improve our company in Minnesota. Thanks for the information, it has helped me gain a better grasp on KAIZEN practices. Here is my company, if you’re interested: Seelye Craftsmen Co. I come from China,thank you for your share. Hi, I am from Malaysia, I find these three phases very useful because it inculcate on the process owners the ownership of the process. Show me and why implies that this is within the ownership of the process owner. Just try it implies now empowerment granted to the process owners. This is a good approach to making Kaizen works when ownership is well defined. The purpose of Kaizen is not only the changes but the sustainability before next improvement. Great stuff. Simplicity works. You don’t need fancy new trademarked management systems. Asking why, asking to see, experimenting on a small scale (and letting and encouraging people to) is great. I also always love to see mentions of Design of Experiments. This tool is a great, powerful and underutilized. One of the best things about six sigma is the increased use of Design of Experiments it has brought to some organizations. Do you have more information on Mr. Shimbo? I have heard of Mr. Nakao and Shingijutsu, but have not heard of Mr. Shimbo.